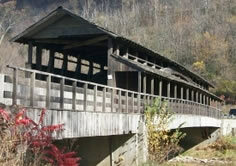 The Claycomb Covered Bridge is one of the 14 so-called "kissing bridges" in Bedford County. The Claycomb Covered Bridge, located north of Bedford, Pennsylvania, on Business Route 220, is one of the 14 so-called “kissing bridges” in Bedford County. The bridge, originally constructed in 1880, is the only access point to the historic Old Bedford Village. P. Joseph Lehman, Inc., Consulting Engineers was responsible for the engineering design for the relocation of the bridge in 1975, when a pedestrian walkway was also added. In 2002, we undertook a new project to preserve the historic structure and make it accessible to cars, light trucks, school buses, and tour buses entering and exiting the village. Project funding in the amount of $3 million was channeled through the Southern Alleghenies Planning and Development Commission and the Pennsylvania Department of Transportation.